We Are Nearly There But Is There Reason For Optimism? The new season draws near, lets look at the reasons to be optimistic and the reasons why perhaps we shouldn’t be. We are nearly there folks. The new season is nearly here, and our enthusiasm is rising. 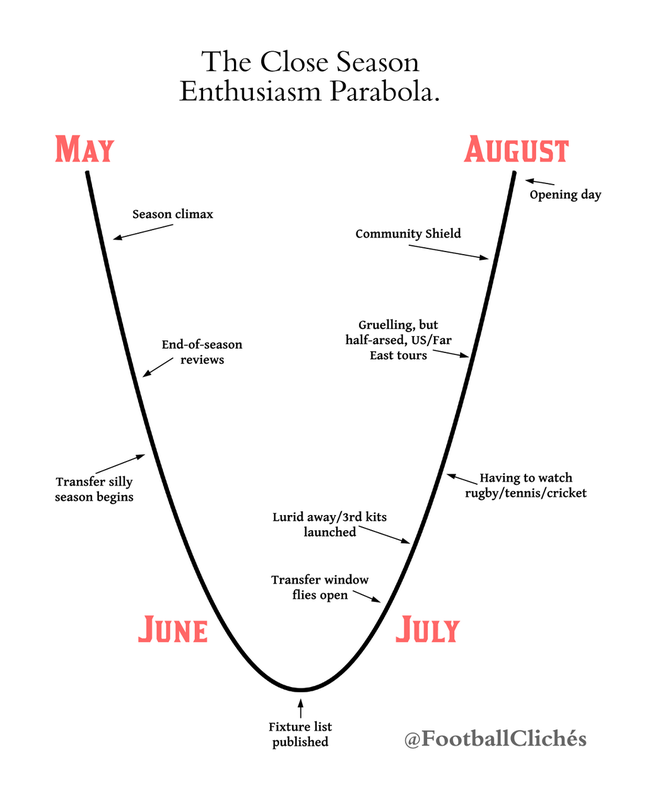 This is shown by this Enthusiasm Parabola, courtesy of @FootballCliches. With the rather drab Community Shield passed, only a few pointless international friendlies stand between us and the new season. I know plenty has been written about new season expectations, many of which seem to predict us on top of the pile come May 2014. What I’m here to talk about, is whether such predictions are justifiable and whether there is reason for us Chelsea fans to be optimistic. A sudden change from the experiences of last year, that is for sure. The main reason for wide spread depression amongst Chelsea fans last year was the Interim One – Rafa Benitez. With Rafa now off at Napoli, and stealing Arsenal’s transfer targets, Chelsea sought the replacement and struck gold. Jose returned, completing the better romance story since Twilight. Roman flirted with Pep, but to no avail, so Jose was approached. Will the return prove a successful one? I think so, and obviously the Chelsea hierarchy do too. Some have labelled this the signing of the summer, with a manager with a point to prove taking the reins into a title battle with some rookies, it looks promising indeed. For all that has been written about Mourinho in the press, you mustn’t forget the quality of talent at his disposal. A manager alone can’t win a title, he needs players like Eden Hazard and Juan Mata to help. Now grounded in the Premier League and well accustom to English game, these two players will be pivotal to any success the club has over the next 12 months. If we manage to win the league, it seems very likely that we will see these two nominated for Player of the Year yet again. We don’t have just the one promising Belgian talent though. We have two more. The versatile and TinTin look-a-like Kevin de Bruyne, and raw power of Romelu Lukaku are more reasons to feel optimistic. KDB played everywhere in midfield for Bremen last season, and his versatility could work well in his favour over the coming season. Impressive in pre-season, KDB could see 2013/14 be the season where he truly announces himself on the world stage. Romelu Lukaku is in a similar situation. He returns with a point to prove, and if he can handle the pressure, Lukaku could easily better his goal tally of last season. That is though, if he is chosen as the main spearhead if Rooney or Eto’o aren’t brought in. The young talent is what makes me optimistic. To have players like Oscar at your disposal as possible back ups, you must have one strong squad. We have plenty of positives then for sure. A top manager, young talent, a seemingly united and happy squad. However, there are possible reasons to be fearful. If David Luiz toddles off to Barcelona for a hefty price tag, we are suddenly left with a shaky defence (if you watched the game vs Real Madrid, you will have seen what I mean). Sure the money we could get for Luiz would be helpful, but as our best centre back, selling him to a European rival would show a lack of ambition. Terry keeps getting injured, Cahill often looks shaky and Ivanovic is prone to the occasional high profile gaffe. Sure, we have some youngsters we could toss into the mix, but Luiz would leave a big hole in that back four – and no, not just the size of his hair. Luiz was exceptional in the Confederations Cup – bar a penalty – showing fantastic passion, leadership and discipline. We need to harness that. I’ve been thinking for most of the summer we needed a new centre back, and if the club sell Luiz, we’ll need two new centre backs. We can all declare who we would like as options, but for me there is no negotiation. If we want to compete at the highest level, we can’t sell Luiz. Being a pessimist, I have another concern. Whilst we have lowered the average age of the squad and that is all good, we have sacrificed an awful lot of brute force. Especially in midfield. I tell you what, seeing a midfield pivot of Marco van Ginkel and Ramires going up against Yaya Toure and Fernandinho, I think I will wet myself. Aside from CFC360 favourite John Obi Mikel, the mountain Romelu Lukaku and a couple of our centre backs, our squad sure lacks strength. Sure, we have the technical talent. Our little, skilful players can run around and pass all day, but once Wanyama is hurtling at Oscar, we had better hope Oscar has life insurance. In order to satisfy Roman Abramovich’s fancy football fetish, we have ditched the successful blueprint of winning with power – see Didier Drogba – and replaced this with some handsome and talented footballers. Xavi, Iniesta and Busquets came up against Schweinsteiger and Martinez last year, and remember who won? Those who had got on the weights. Anyway, plenty optimistic thoughts, and some I didn’t mention but no matter. New season, new manager, new players, fresh optimism. Can Chelsea win the league this season? Yes. Will they? It’s impossible to say. Pre season friendlies do give a teaser about what the new season may have in store, but you shouldn’t read too much into pre season results and performances, no matter how hard it may be. With Jose in charge, and Eden Hazard playing, I have a good deal of optimism for success this coming season. Provided we can shorten our trademark November-December slump, we stand in high contention for the silverware available. Bring on the new season! Are you feeling optimistic about the new season? If so, why? If not, why? Your feedback and opinions are always welcome, and healthy debate is always good. Thank you for reading. Ivanovic is not good @right back, Mikel should play more n buy a striker(IBRAHIMOVIC,LEWANDOLSKI). One of them please. Bet your a Nigerian Mikel is slow and laborious he slows down our counter attacks by holding the ball too long and gives the ball away too often in dangerous positions and does not screen the defence………Ivanovich is solid were ever he plays apart from stupidly giving the free kick away(an art also perfected by Mikel)neither of the two goals by Real were his fault in fact Azpilicueta was way out of position constantly. Please we should advise cfc to cash in on eto o and suarez/rooney.we need man city midfielders to fall back much often when we go on the offensive and please get de Rossi to help essein hold of yaya toure.I do not see any problems if this is done.I have no fear for fernadinho.not one.City will fall to Chelsea this term.Nobody should sell luiz(give him vice captain immediately and make lampard captain this season coz he deserves it).get eliakim mangala,coentrao and ryan shawcross/agger(if we can’t get suarez and we get rooney and eto o is a must)Then we will be unstoppable! !.Up Chelseeeaaaaa!!!! Why? Van Ginkel has been our most consistent player in midfield and there is a better younger option at Bayern too De Rossi why we are giving the goons a clear run is beyond me a top striker is a bigger must than midfield. Personaly as a chelsea fan, i will say am optimistic about our sucsses. The manager is one of the best who know the league. We have players that want to prove them selves, young talents in all position, couple with expirence players. I see us doing well this season and next. On luiz, i would want him to stay cos he is part of the team. But if he want to go, we should get a replacement for him. Agreed apart from the ”one of the best managers” Comment HE IS THE BEST. It seems that its Luiz who is making the noises like Suarez and Rooney if he is forced to stay and gets sulky there would be no point I want players who will die for Mour,the club and fans whenthey wear the shirt. Lukaku WILL face different pressures and will also ace the bus defences. Sorry I don’t trust Torres one bit and he didn’t show me anything in pre-season he has had 2 spells of 5 months without a league goal and as fun as winning the CL was the EPL comes first for me. Ba is not prolific although FSW treated him abysmally for me and had he played more league games we would of not had to wait until the last game to be certain of the CL spot. I have no sentiment for a striker who has just 15 league goals in 2.5 seasons so would get rid of Torres and get both Eto and Rooney although convincing both to come when they know the other is would be difficult. why do all these muppets keep thinking mikel is good. Hes NOT he is pants and the quicker hes gone the better. Essein offers the physical bite in midfield. Jose knows hes pant that’s why he hardly played in the first spell. I positive Mikel gets hes mates to post on these rumour sites. Hey bro talk all you want, Mikel is a good standing No. 4. As far as I’m concerned apart from the fact that he doesn’t score goals, he’s a very good defensive midfielder. Good passing abilty, strong in tackle, difficult to pass etc. So Bro before you call him a pant please state your reasons clearly. Why be anonymous? he is slow gives the ball away too often or puts his defenders in difficulty. He holds the ball way too long slowing down the tempo of our counter attacks. Also he gives away far too many free kicks in silly dangerous positions. Not sure where you get he has a good passing ability and strong in the tackle he does that by fouling. He never gets tight to opposing forwards or attackers and rarely supplies a screening shield in front of defence and he was an attacking midfielder before we signed him and cannot shoot straight. I’m certain most people who defend him are Nigerians and don’t actually go to games.